What a delightful pattern for your special girl! 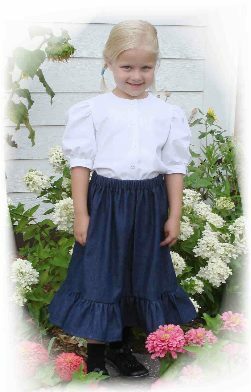 This girls pattern includes 3 different dress style options with a peter pan collar, pointed collar, or ruffle neck edge, back zipper closure, and long or elbow length puffed sleeves. Pinafore comes with a back button closure and a back tie belt. Bonnet pattern is also included. Choose girls size 2-7 (fits chest of 21"-27", waist 20"-23"), or size 8-14 (fits chest of 27"-32", waist 23.5"-26.5").